Marina di Fiori, in the Porto-Vecchio region, Southern Corsica, with its exclusive reputation, beautiful setting and nearby shops, is still much in demand. This luxury destination with its delightful beaches and variety of activities is ideal for investing in high-end real estate. The district of Marina di Fiori, located in Southern Corsica, in the town of Porto-Vecchio, is one of the island’s most exclusive areas, with numerous leisure activities including wind surfing, water skiing, canoe-kayaking, diving, horse-riding, hiking, tree-top trails, tennis courts, excursions to rocky creeks (calanques), parachuting, car hire, cycling, quad and motor biking etc. When you buy a luxury property in Marina di Fiori, you’ll enjoy access to a varied daily menu of exciting activities. Although located on the edge of a private estate, near the Sporting Club, Marina di Fiori is a public area. It is, undoubtedly, one of the most beautiful beaches in the region. When you buy a luxury property in Marina di Fiori, you get to enjoy this 350 m stretch of sandy beach, right next to the town centre. In summer, the welcome shade of the trees creates an ideal temperature. Marina di Fiori’s private port, north of the beach, further enhances its charm. Why choose a luxury property in Marina di Fiori? Marina di Fiori has much to recommend it. 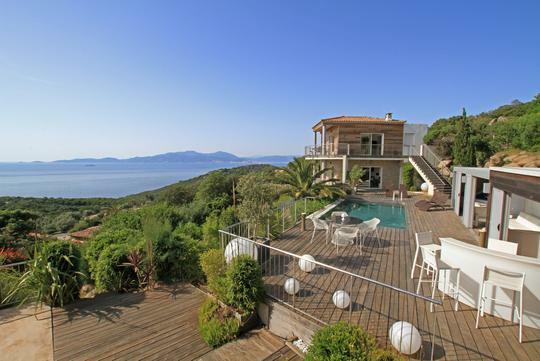 It is located near the Gulf of Valinco (80 km from Ajaccio and Figari), known for its numerous beaches, delightful bays and the promise of exceptional real estate. There are boat connections via Ajaccio or Propriano port, or flights via Ajaccio or Figari airport. In short, there are a multitude of reasons why you should buy a luxury property in Marina di Fiori.